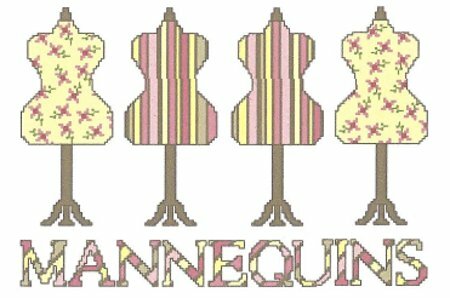 "Mannequins" is a counted cross stitch design by Alice & Co.
"Mannequins" is a counted cross-stitch chart with instructions translated in English. It is part of a series called "la Boîte à Couture" (the Sewing box). Recommended Fabric: 18 count linen Aida or 32 count linen, colour "off white" or "very light sand (platinum)", dimensions 45x40 cm (18x16 in).